My husband calls from work and says he will be coming a little late tonight. Of course he had to compensate for the work he had missed in the morning. He had stayed home watching the cricket test match where India played Vs England. Wonder what’s with cricket and guys! Hmmm…I think that can be my blog material for some other time. With no mood to cook, I reluctantly entered the kitchen. I cleaned up the dishes that were lying since the afternoon lunch. Checked my fridge to cook up something simple and I spotted a handful of thondekayi’s (Ivy Gourd) lying there. I had got them last Tuesday from the local Indian grocery store. It had been a while since I had cooked them, so I decided to make a Palya (curry) from them. Since hubby dear was to be late, I decided to capture the process in my camera and blog the same. Long long ago..when I was a kid, we grew thondekayi in our garden. It’s a creeper and we used sticks to build a small support system for them to grow. The Palya made from these fresh kayi’s are yummy… ok, enough of my story. Let me quickly write the recipe for the Palya. Wash and cut each gourd (kayi) into 4 pieces. Be sure to trim off the edges. Heat about a little oil in a pan. Season it with mustard, jeera, red chilli’s and channa dal. Add a few leaves of curry leaves if desired. After the mustard seeds sputter, fry onions till golden brown. At this point, I add Saarina Pudi (You can use red chilli powder instead). I just allow it to get cooked in oil for a second. I feel it gives a great taste. Add thondekayi and little water and cook till tender. Add salt as per taste. 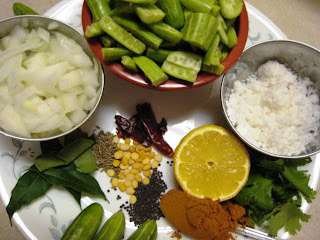 Garnish the cooked curry with grated coconut, chopped coriander leaves and with a little lemon juice. Discard the thondekayi if they are red in color when you cut them. It gives a bitter taste. Add about half teaspoon of sugar/jaggery for those sweet buds. It tastes good, believe me! I am done with my cooking and photo taking sessions and still, no sign of my husband. The Palya looks so good.. that my mouth begins to water! I take a little to taste and its yummmm. And the next thing I know is that I’ve finished it all, without waiting for hubby dear ;) c’mon it was so tempting and I couldn’t wait…slurrrrrrp!!!!!!!! thondekayi play looks yumm!my favorite too:) i make it even with garlic roasted too. 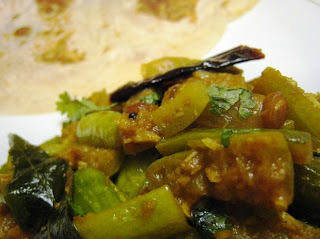 ummm, another K'taka blog and loved all your dishes. Palya looks yumm. Btw nammaejamanru raatri ella eddu cricket nodthare. adenu huccho enooo..devrige gottu. thankyou folks for your comments. Its kinda encouraging me to post more... Dhanyavadagalu!